Unprecedented heat waves, floods, bushfires… at a time when the effects of climate change are all too evident in Australia, the premise of A Region Where Nobody Goes, by new local theatre collective Lindstedt & Davies, feels frighteningly relevant. Set in an imagined future Australia, the work follows Bree, the prime minister’s speech writer, as she faces the challenge of writing about the natural disasters that are besetting the continent. 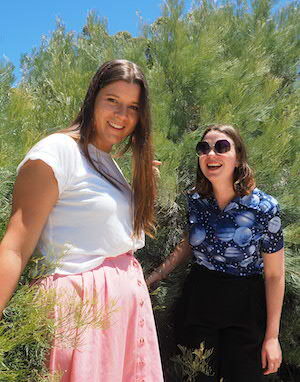 Seesaw chatted to the pair behind this dystopian two-hander, Anna Lindstedt and Sally Davies, to find out more about the two artists and the show they’ll be presenting at Fringe World. Anna Lindstedt and Sally Davies. Photo: Bianca Roose. Seesaw: When did you first know that you wanted to work in the arts? Anna Lindstedt: I made my prestigious theatre debut as The Lorax in my primary school’s rendition of The Lorax. After that, I knew. I always enjoyed performing and telling stories from a young age. It was when I left school, however, and started studying and making theatre that I really started to think of myself as a theatre artist. Sally Davies: I was planning to study social work at uni but when I went to an information night in year 12 I realised it probably wasn’t for me. I always liked English at school so I thought I’d pursue writing. AL: I completed a Bachelor of Arts at Curtin in 2017, majoring in Performance Studies. This took me three and a half years, and during this time I also did a bunch of other theatre and film related short courses around Perth. However, the best training and experience I’ve gained so far have come from getting amongst the Perth theatre scene and working on shows with other like-minded artists. SD: Like Anna, I studied at Curtin, doing a double degree in Performance Studies/Creative Writing. I’ve been really lucky that in the last couple of years I’ve been able to work with some talented and creative people from whom I have learnt a lot. AL and SD: Our previous shows have all been very different in style, content and themes. 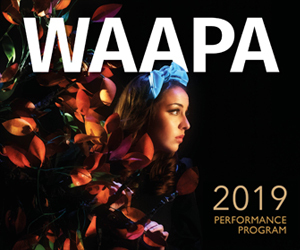 We chose to partner up because we are both passionate about uniquely Australian theatre that is relevant, socially conscious, inclusive and playful. We hope to continue making independent theatre in Perth that explores a range of topics in new and interesting ways. SD: I don’t think I have a career highlight. I’ve been a part of so many great teams that I would struggle to pick one moment or production. I’ve really enjoyed working with Fonder Factory at Winter Nights and with Jess Moyle to write Tunes from the Roadside (by Lindstedt and Davies). Tale of Tales (by Claire Testoni) is also memorable because it came at a time when I felt I wasn’t contributing much to the Perth arts scene, and broke me out of a bit of a slump. AL: I also have been very lucky with the great projects I’ve been able to be a part of. I can’t rave enough about how grateful I am to have worked with the amazing team of Toast (by Maiden Voyage Theatre Company) and what an amazing opportunity that was for me to learn from so many people that I admired so much. I also played The Cat in the Hat in my Year 11 production of Seussical the Musical, and that was cool. SD: When I graduated uni and didn’t have any upcoming shows, I was feeling a bit useless and dejected. I’ve since accepted that I need to work hard to make stuff happen, and that I have to be constantly working for opportunities. AL: In the period between high school and starting my degree, I had a few unsuccessful attempts at getting into drama schools and it really made me doubt my own capabilities and future as an artist. I believed that there was a streamlined pathway to becoming a successful actor, and I’d missed the boat. In the years since, my whole perception of the industry and sustainable arts careers has changed, and now I really value this perceived setback. It led me to Curtin and the many incredible theatre-makers I met and worked with there. SD: I did a devised show in my third year of Curtin, where I forgot to bring my phone onstage to use as a prop, so I panicked and used my shoe to make a phone call. AL: In an audition, I was using my water bottle as a prop and in a moment of blind passion I threw it on the floor. It split, and water went everywhere. As soon as I finished my audition I had to frantically apologise and mop up all the water. I still got cast though. SD: I feel very lucky that we get to make up a story and then people will come and share it with us. The collective of theatre makers in Perth are all amazing and I love that I’m part of it. AL: I love the moment just as the house lights are about to dim, and the show is about to start, and you know that whatever happens in the next hour or so is going to be a shared experience between only the people in the room. SD & AL: A Region Where Nobody Goes is a theatre piece that follows Bree, played by Anna, and her journey in the end times. Bree is the speech writer for the Prime Minister and is trying to make sense of a series of natural disasters that is wreaking havoc in Australia. We wanted to be able to talk about climate change and wilful ignorance in a way that is real and urgent. Australia has such a rich and dangerous history, and we wanted to see how that applied to modern problems. SD & AL: We are both working (separately) on “600 Seconds”, and Sally is working in a technical capacity on “MicroMove” and Wil Greenway: Either Side of Everything. We are really keen to see amazing local artists in Feminah, Poorly Drawn Shark, Manwatching, and Grace. Touring acts that we can’t wait to see are Djuki Mala and Little Death Club. AL: I love the roundabout. SD: I like the swings. A Region Where Nobody Goes plays The Blue Room Theatre, as part of Summer Nights, January 18-20.